1. Aluminium cylinder and cylinder head. 3inHg; negative pressure. 0 to -1inHg. 6. Detailed English/German/Spanish instruction manual. 7. Blow molded hard case package. 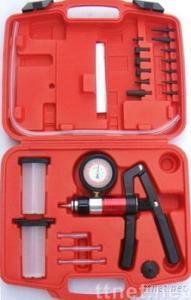 pressure gauge, a brake fluid reservoir and pipe joints.